Every year, as my anniversary approaches, I become increasingly stressed trying to find the perfect gift for Princess Wifey, but this year went much smoother! My luck began, last fall, when my wife and our friend attended an art show, and came across a unique and masterfully-crafted, functional art piece. 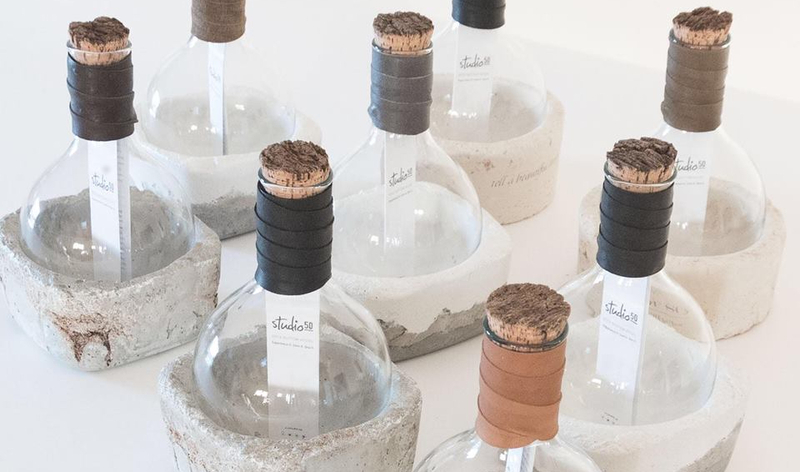 The item was a piece from Studio 50’s Rock Bottom Collection, and consisted of two parts…a glass flask, and a base made of varying types of stone. Depending on what type of beverage it was being used for the stone base could be either heated up or frozen, resulting in the liquid in the flask being kept hot or cold. After I learned that my wife had fallen in love with the piece, I was on a mission to purchase it in time for our upcoming anniversary, however, the art show only occurred a couple of times a year, and wasn’t going to be in town until after the big day. Fortunately, the products were available online, and while I preferred to see the various choices in person, I wasn’t going to be able to do so. Enter Kim, from Studio 50, who I connected with first via email, and then over the phone. Kim was more than happy to answer all of my questions, with unfounded patience, and clarified how they shipped the merchandise, and how long it would take to arrive. My only dilemma was deciding on a colour for the leather wrap that came with the set, and Kim was kind enough to send me samples of a couple colours, with the option of exchanging them if necessary. At one point, she became so familiar with me, she would ask about the condition of my aunt, who had recently broken her hip. Although a little thing, I was quite impressed that she remembered, and grateful that she cared enough to ask about her. Of course, I did end up buying the piece for my wife, and the package arrived quickly, and safely wrapped in paper and bubble wrap. Clearly they have their shipping down to a fine art! Studio 50 also advertises a variety of stunning pieces, including a concrete table, a hardwood mirror, and much more. Prices are reasonable, and the pieces are truly beautifully made and intricately designed. If you’re ever looking for a unique gift supported by excellent customer service, take a look at Studio 50!